I did not intend to disappear for the entire month of January. But sometimes life gets hard and it takes everything you've got to trudge through one more day. That's how it was for me. And I'm so glad that the month is OVER!! 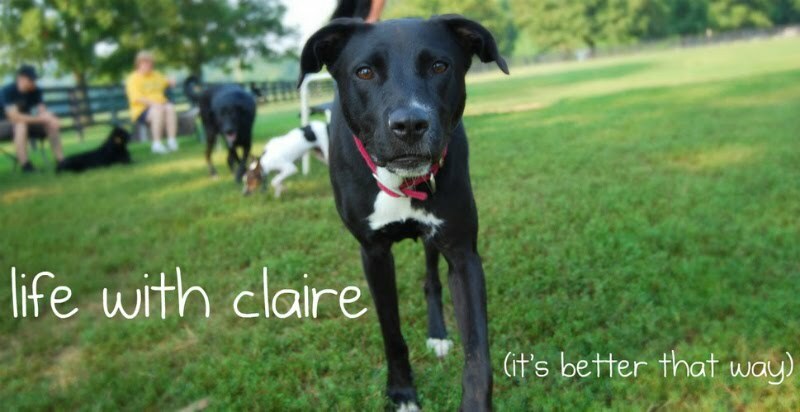 In addition to my health issues continuing to beat me down, I also found out - just a few days after Christmas - that Claire had a malignant tumor on her paw. She had surgery during the first week of January to remove it, and I was supposed to hear the pathology results a few days later, but the lab was closed for the holidays. During her recovery, she managed to rip her stitches out, despite wearing the Cone of Shame while I was at work. I came home and found little bits of her cast all over the house before realizing the bigger issue: ripping the stitches out had allowed the wound to gape open, exposing her bone. I rushed her to the hospital immediately and she underwent a second surgery to debride, flush, and pack the wound before stitching it up again. I didn't let her out of my sight for the next 12 days to give it time to heal. Of course, on Day 13, when I went into the office, I came home to find that she had managed to rip out the stitches again despite wearing TWO Cones of Shame at the same time. We rushed back to the vet, but thankfully the surgical site had healed enough where she didn't need to undergo a third surgery. By that point, the only open part was the top layer of skin, so that healed after a week of hydrotherapy and some good bandaging by yours truly. Tough recovery, I'm telling you! Additionally, I didn't get the pathology results back until just a week ago - exactly one month after the tumor was removed. Thankfully, they managed to get all of it and she does not need to undergo radiation or chemotherapy. I don't think I realized just how much the What Ifs were worrying me; when I heard the results, I literally felt like a weight was lifted off my shoulders. After all that, however, Princess Claire has a paw that is as good as new! The beginning of this week was a bit stressful for her as we got back into our normal routine. After being with her almost 24/7 for a month, she had a little separation anxiety for the first few days that she was left alone. She seems to be feeling a bit more confident now, but realistically, it may take a little longer for her to feel 100% while I'm at work. My intent over the next few months is to get back to blogging on a regular basis. Of course, this all depends on how I'm feeling physically, but I'm finally feeling well enough to start doing other things rather than just work and sleep! Good thing that Claire is a snugglebug. I swear, even as I was taking care of her over the past month, she still managed to take care of me.